The real estate bubble in China may be coming to an end. NEW YORK (CNNMoney) -- The real estate market was on fire. Buyers were snapping up sparkling new condos faster than developers could build them. Investors were grabbing two, three, four apartments each, hoping to cash in on skyrocketing prices. But then the music ended. Prices started to slide. Developers were stuck with empty buildings. Homeowners saw their wealth begin to slip away. Sound like the United States in 2007? Nope. It's China in 2012. After experiencing a red-hot growth in recent years, China's real estate market is starting to falter. Developers are offering discounts to unload their unsold inventory. Spooked by falling prices, would-be buyers are staying on the sidelines, while investors mourn the decline in value. But will a housing downturn plunge China into its own Great Recession, as it did in America? Experts say it will certainly hurt, but it's not likely to spark the same kind of crisis it did in the U.S. The Chinese, who have only been able to own homes since the late 1990s, have never experienced a sustained slide in real estate before. They have been pouring money into housing over the past decade since they had few other investments to park their savings in. Also, in response to the global financial meltdown, China's government loosened restrictions on lending to keep the economy growing at a nearly 10% clip. This prompted home prices to rise by 50% over the three years ending in 2010, said Nicholas Consonery, analyst at Eurasia Group, a political risk research and consulting firm. Just like their American counterparts, the Chinese wanted a piece of the real estate riches. So they bought apartment after apartment, never intending to rent them out, said Patrick Chovanec, associate professor at Tsinghua University in Beijing. Instead, they just wanted to stash their cash and capture the appreciation. Accurate statistics are hard to come by in China, but various estimates say there are between 10 and 65 million vacant units held for investment. "Every city in China has a new development district with row upon row of condos that are sold, but empty," Chovanec said. The Chinese government, concerned by the steep run-up in prices and residents' frustration with the lack of affordable housing, stepped in in 2010 with measures to rein in speculators. These included higher downpayments, tough qualifications for mortgages, residency requirements and limits on investment purchases, Chovanec said. But developers continued to borrow and build, thinking the government would back down to maintain economic growth. The bubble expanded to new markets in second-tier and third-tier cities. When officials didn't budge, developers finally had to concede. Last summer, they started liquidating their inventories and slashing prices. That prompted recent homebuyers to protest and even riot in Shanghai, Chovanec said. Sales collapsed, dropping close to 20% in the first quarter compared to the year prior, said Nicholas Lardy, senior fellow at the Peter G. Peterson Institute. And there is virtually no growth in housing starts these days. Prices have also fallen, though the estimates vary widely. Official statistics show a drop of only a few percentage points in major cities, but experts have heard developers offering discounts of up to 40%. There's little debate that China's real estate boom is fizzling, but experts are somewhat divided on how badly it will rock the country and the world. There are several important differences between the U.S. and Chinese real estate markets that could cushion the blow for the Chinese. A primary one is that homebuyers in China always had to provide down payments of at least 20%. Owners have 40% to 50% equity in their homes, on average, Lardy said. Default rates are very low. So they won't be hurt as badly by falling prices as Americans were, though they will see their wealth diminish. Some 40% of wealth in China is in housing, compared to 32% in the United States at its peak a few years ago. Developers, however, are hurting because they are overleveraged. A handful of small ones have already declared bankruptcy -- a rare occurrence in China -- and others are on life support. "This is a classic real estate bubble," said Susan Wachter, real estate professor at the University of Pennsylvania's Wharton School, noting it's more similar to America's real estate problems of the early 1990s, which were due to overbuilding. "It will take time for absorption." Banks could also be in trouble because much of their collateral is real estate. And local governments are suffering because they rely on land sales to repay debt and cover up to 40% of their operating budgets. 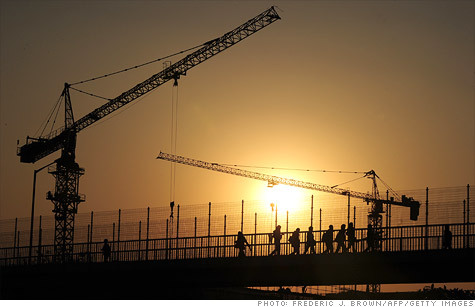 The Chinese economy, however, may feel more of the sting as the housing market slows. Around 10% of economic growth in China last year was directly related to real estate development, so it will be hard for the country to keep up its blistering pace if housing investment cools. By comparison, residential real estate construction in the United States peaked at 6.1% of the economy in 2005. "There's a correction starting and if nothing else happens to offset that, economic growth could slow quite substantially," Lardy said. And if housing development stumbles, other sectors of the Chinese economy will feel the pinch. Companies that provide building materials, including steel, cement and copper, will experience diminished demand. A slowdown in China's economy will also be felt around the world. Manufacturers in Ohio, for instance, have been prospering recently as they try to supply China's infrastructure needs. And Chinese consumers have been spending money on traveling and buying products from America, Europe and elsewhere -- boosting the economies of countries around the world. Still, the future of China's real estate market remains unclear. "No one has hit the panic button yet," Chovanec said. "Everyone is holding out hope that at some point it turns around somehow. But I also think that's a triumph of hope over reason."